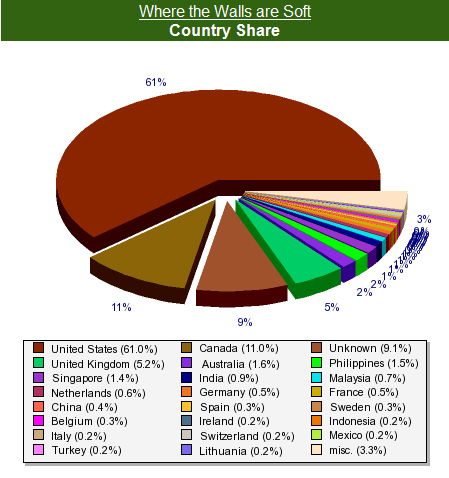 Over 60% of my visitors live in the U.S., whereas, surprisingly (at least to me, anyway), only 11% reside in my own country. Les Says: I agree. On the bright side, though, we know where YOU are. And I like knowing that, ‘cuz I’m fond of you, Jayne, even though you are upside-down. Well, I’m smack dab in the middle of the US and happy to be reading your blog. Ach, my tracker makes me paranoid – all those lurkers out there – eeeeek! Les Says: Yeah, I get a lot of ‘masked’ visitors. Can’t say they make me paranoid any more, though, thankfully. That might fit me a lot of the time. As well as no clue what the date is or even what day of the week it is! Les Says: Oh, Louise… are you in a padded cell, too?! We have more in common than I first thought! Les Says: Hi Mushy!! [flapping arms up and down like an idiot] If you can see me, wave back! You have to admit, it makes for a colorful pie chart, though. And I’ll admit, I’m the one who occasionally flies to misc. to view your site. But it’s only two or three times a year. Les Says: Let me know next time, Betch, and I’ll meet up with you – do all the rooms have mini-fridges in Misc? Cuz I got burned last time.